区块链日报 - Crystal Ball 3000™ : Will the next crypto hype start in 2019? When will the next crypto-hype finally start? Should I put fresh capital into crypto at these supposedly low prices or will it go further down? What is the best coin this year? Not only the rest of the world, also I want to know what 2019 will be like. Unfortunately, predictions are usually very difficult — especially if they are about the future :-). So, let’s get the crystal ball 3000™ out, shake it vigorously and look towards December 2019, to get one or more answers to the questions above. But before I start thinking about the future, I want to reflect on my past considerations. Finally, a track record is important to know to understand whether opinions have been reliable or not. By 2015 I’ve been in the crypto field for just a year, experiencing the extreme crash of Bitcoin from $ 1,200 to just under $ 200. In 2014, I had bought Bitcoin at $ 800, only to sell it back at just under $ 400 at minus 50%. Now, at the beginning of 2015 Bitcoin stood at about $ 250. I was glad to have lost “only” half of my money and not more. The entire market sentiment was extremely negative and Bitcoin was predicted to die. I was completely fresh in the market and so I thought the financial experts and press would be right. Far too little did I listen to real experts who actually knew a good deal in the blockchain area and had a completely different view of the ecosystem. So my prediction for that year was also that crypto would die pretty sure. In retrospect, this point of ‘maximum pessimism’ of the entire community was my absolute worst forecast, but it underlines my inexperience after only one year in the field. Eventually all through 2015, Bitcoin recovered and rose to just over $ 500. The fact that this made me FOMO heavily was a slight understatement, as just a few months earlier, I had sold for $ 400. If I were to buy Bitcoin again, I would have to buy it for $ 100 more than I had sold. Warren Buffett’s quote “If you want to make money by investing, sell more expensive than you’ve bought in” was exactly the opposite of what I was about to do. However, I had founded my own company in the blockchain area in the meantime and started to understand the area a lot better. Also, I was no longer so confused by the press or by people on Reddit and had started to make up my own mind. Therefore I decided to invest almost € 100,000 in Bitcoin, which I had just got from a previously sold apartment. Back then, I had thought that the real estate market was too overheated and that a little less exposure to real estate would not be so bad. In retrospect my opinion on the real estate market was completely wrong — but in return, my opinion on the crypto market even more spot on. I invested the € 100,000, which were about 10% of my net-worth, into the market over a couple of weeks using a Dollar-Cost-Average (investing over a period of time). By the end of the year, Bitcoin had not really moved much and still stood at around $ 500. Although I did not make any profit, there was no loss either. On the one hand, 2015 became the year in which I seriously started investing in cryptocurrencies; on the other hand, it was also the first year in which I started to report on social media about blockchain, cryptocurrencies and Bitcoin. This gave me an enormous understanding and knowledge, which helped me tremendously with my investing. Although Bitcoin had almost doubled from its low in 2014 until the beginning of 2016, the way to get there was anything but easy. The price often shot up and down wildly, and the steady backlash with extreme intraday volatility confused many investors. Some fomo-ed just like me at $ 500, but then sold again at a downswing to $ 300 out of fear that everything could crash. I had however neither sold nor given in fresh capital and just sat out the crazy markets, focusing onto the long term. My insights through continuous learning started to pay off. At the beginning of 2016, the market sentiment was still mixed. Although many of the negative screamers were gone, not many new positive voices had joined. Nevertheless, it was clear to me that the slightly positive trend would continue. Many indications within the industry around companies, technological progress and Bitcoin adoption suggested this for insiders. So my forecast was a Bitcoin price between $ 500 and $ 1,000 for the end of the year. Something that I did not consider all too much however, pushed the price to the upper limit of my forecast. In 2016 we saw the first ICOs on Ethereum. The topic of “Forks” became increasingly important. For the first time since 2014 the press became interested again in Bitcoin. Discounting these three things, I started 2017 with the assumption that the “doubling trend” of recent years would simply continue: 2014: $ 250, 2015: $ 500, 2016: $ 1,000, and now, my forecast for the end of 2017: $ 2,000. I announced this during a webinar with several thousand people. Over the past years, I had learned one thing: if everyone yells “Bitcoin is going to die,” you should buy and if everyone yells “Bitcoin goes to $ 100,000”, you have to sell. Therefore, on December 26, 2017, live on CNBC, I announced that I would foresee a drastic setback for 2018. After consulting a chart trader, I came to the conclusion that we would see the $ 5,000 (-75%) and the $ 50,000 (+ 150%) inn 2018 — just in which order, was not very clear. Furthermore, I publicly stated that because of my prediction for 2018, I would trade nearly 20% of my crypto assets into Fiat. A shitstorm roared over me: People called me the “Crypto-Judas”, since I should not say such negative things in public! Well… Today you know what happened. Now it’s early 2019 and looking back, hindsight is 20/20. My assumptions had been spot on and everyone who listened and sold over a year ago is smiling — just like me. Bitcoin is now just under $ 4,000 and everyone who had sold, could, as I did mid-2018, buy on the cheap. For example, in Q3 2018 I bought the same amount of Bitcoin and Ethereum that I had sold at the end of 2017 — of course now under 25% of the price that I had sold it for. Naturally from the current point of view it would have been better to sell 100% one year ago and then buy everything back, but in the long term, that will be pretty much not matter. But what happened to my forecasted $ 50,000 bounce? Did I mess up my analysis in early 2018? I had expected that countries not only speak more positively about Bitcoin, but also to act on it. For example, the Bitcoin ETF has still not been approved in the US for two years by now. There are also still no clear guidelines for ICOs in most countries although security token offerings (STOs) are already partially possible, trading platforms and transnational regulations are not yet available. All these reasons led to a delay of the bounce. In the first five years of Bitcoin, the prize was driven by the Shiny Object “cryptocurrency”. In the last five years, especially a new use case with ICOs and Dapps happened on Ethereum. In 2018, the question arose as to what the next decentralized killer application would be on the blockchain. Stablecoins? Non-fungible tokens (NFTs)? Security Tokens? Or something completely different? Nobody knows and that hindered the prices from rising. In 2018, it became relatively clear that the current applications on the blockchain are little used by people. Cryptocurrencies are seen more as speculation than as a currency, and promises of many companies vanished. All this led to the fact that we had taken the “right” direction, but in no way in the expected time horizon. In any case, what has not happened yet, will, in my opinion, still come, and anyone who has bought Bitcoin will benefit in the long-term. What is the situation however for 2019? Instead of giving you a simple prediction that I’m not backing up, I’d like to give you a more in-depth look at my approach. This should allow you to make up your own mind around the subject. Should stocks, bonds or real estate fall sharply this year, a liquidity squeeze would rather pull money out of cryptocurrencies than bring it in, and would likely lead to a cryptocurrency crash. Although this issue is somewhat controversial among experts, I personally can not imagine that such a volatile asset class as cryptocurrencies could be considered a safe haven during a financial meltdown — rather the opposite. However I do not think that we will see a complete crash of the markets in 2019, at the most a slight decline. Therefore I would see this scenario as possible, yet not as likely. If, contrary to expectations, a government declares a ban on cryptocurrencies, this should clearly be considered bearish. Depending on the size of the government (US, EU, etc. ), this could negatively affect cryptocurrency. Personally, I see such a case as very unlikely, with just about every major government advocating blockchain. As a member of many workshops of the European Union, I have not heard anything different than that positivity. If there were a systemic crisis, for example because a large and significant exchange or an important cryptocurrency were hacked, this could lead to a loss of trust and thus to a price decline of cryptocurrencies. However, this would have to be quite systemic, because many exchanges have already been hacked or big coins like tether seen on the edge. And, despite the Bitcoin price having fallen in the short term as a result, it has not led to a permanent decline since the MtGox scandal. So I think such a scenario is possible as an event for 2019, but not likely as an outcome to negatively affect prices. The criticism that there is no use for most blockchain applications until now may be justified. On the other hand, if one accepts this statement, one must admit that there is practically only one direction from here: upwards. I can not imagine that we will see even less use of decentralized applications. How should something like that look with Bitcoin? Even less currency and more speculation — then we would have 2017 all over again. Less use of Ethereum, Tron, Ripple, IOTA, etc. — 2017 all over again. I just do not believe that we will see less use here. Rather the opposite. Many of these projects know it is time to deliver and are currently trying to solve use cases and build user bases. The statement of many “crypto haters” that there will be even fewer applications in 2019, is difficult for me to grasp — how could there be less? If it will be even less of something, then it would be hope and that, as we all know, dies last. Decentralized blockchain applications need a purpose and attention — otherwise the product or the service will not be used. We have already discussed the purpose under point four, but what about the second part of the equation: attention? Could attention in the media and among investors fall even further in 2019, thereby pushing the price down even lower? Although I personally believe that 2019 will be a very quiet year in the media, there will still be plenty of debacles to speculate over, as well as successes that will attract attention and interest. In sum, I see these five points, which would lead to a decline in cryptocurrency prices, all as possible, but not as likely. Therefore I personally do not think, that prices will slip much further. So, what does the other side look like? 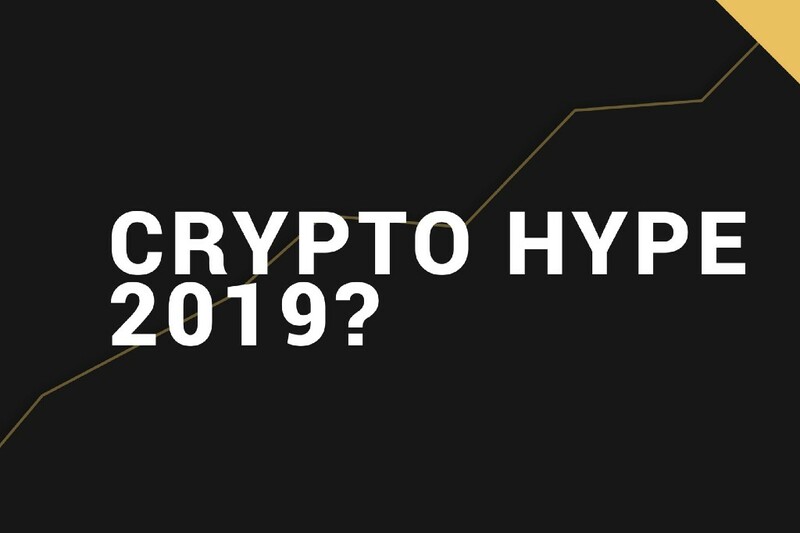 2019 — the next crypto hype? Whether we are talking about the use case “currency” with Bitcoin or “dapps” with Ethereum — all have been extremely hyped in the past. If, contrary to expectations, a rapid strengthening of these use cases occurred, prices would rise relatively quickly. Personally, I see this as extremely probable in the long term, but not within a year. Just as the Internet took decades to create killer applications, so will blockchain applications. As I mentioned before: hope and thereby prices might vary greatly, but actual execution and therefore substance takes a bit longer. Access to cryptocurrencies is always seen as a limiting factor for newcomers. Whether we are talking about complex exchanges or the cumbersome storage of private keys, all of this clearly does not make it easy for newbies to get into the crypto sector and thereby generate increased demand. For HNWIs (High Net Worth Individuals), there are a few more questions: How can you buy millions of dollars in cryptocurrencies at once without moving the market? How do I secure my keys? How do I protect myself from blackmail or kidnapping? From personal experience I know that for these people it is often easier or even safer to leave their coins on exchanges or not get into the markets at all. Companies such as Bakkt or a Bitcoin ETF would provide a completely different type of convenience especially for institutional investors, but how, what, when and who exactly, that’s still in the stars. Personally, I am very pessimistic that a Bitcoin ETF will be approved in the US in 2019. Likewise, I do not believe that 2019 will solve the “inheritance problem” of cryptocurrencies, or that new investors will find their way around the crypto jungle of thousands of coins. Thus, I do not see any major price increases here. If existing use cases can not push the market up, it could possibly be a new shiny object, just like 2014/2015 Ethereum with ICOs — right? It could, but the question will be what this new use case is and whether it is actually driving the market up. For example, even though supply chain may be a killer application on the blockchain, it may not necessarily mean that it will bring increased demand for cryptocurrencies. This only occurs if, for example, Bitcoin is needed to get into this new field. With Ethereum and the ICO tokens, this had been the case, leading to the extreme bullrun of 2017: to invest in tokens with ICOs, you needed ether and almost always needed bitcoins. But what about the use case of decentralized data storage, which I see as a potential candidate for the next killer app? Do you need Bitcoin for that? I am not 100% sure. What about other new “crypto use cases”? Security tokens are said to be the next hot thing, but in my opinion they are likely to be limited regionally due to slow crypto regulation. Stable coins are more likely to extract liquidity from mostly highly volatile cryptocurrencies rather than provide more, and non-fungible tokens will likely take two to three years to create the killer use cases. All in all, I see potential here in the mid term (3–5 years), but not yet in 2019. If 2019 does not lead to a global financial crisis, but rather to a gradual loss of confidence in central institutions, this could be extremely bullish for decentralized cryptocurrencies. This is definitely a possible scenario for 2019. On top of that, I could imagine that after a financial set back, cryptocurrencies will recover first and be seen as a future alternative to centralized asset classes. However, because of this unprecedented scenario, it is not really possible for me to provide a good analysis here, and this equates to more guesswork than knowledge. So while I see such a scenario as realistic, I can not attribute it to a probability, but rather see it as the icing on the cake for Bitcoin in 2019. This leads us to the last and final point that will in my opinion actually end up as the catalyst that will probably start the next bullrun: The Bitcoin Halving in 2020. Price arises from supply and demand and so far we have discussed all the factors influencing demand. Bitcoin’s supply is controlled solely via the Bitcoin algorithm and already the last bull runs in 2014 and 2017 started mostly because of the halving. I could foresee that this time will be similar. The past is not necessarily repeated, but it often rhymes. However, the halving will not happen in 2019, but in 2020, which leads me to the conclusion, that we will not see a major bull run in 2019 because of these five factors. So, I think that in 2019 we will neither see a drastic price decline, at the same time also not the mega incline of prices, but rather a stagnation followed by a slight upward trend. In purely factual terms, the year 2019 reminds me of four years earlier: 2015. If this year goes somewhat similar, we will also see an up and down of the price in 2019, with a slight uptick at the year end. As a result of this wavey movement, many investors will rather sell out of panic when prices fall, and buy more out of greed when prices rise. This will make them lose a lot of money and eventually get out of crypto. I can easily imagine that many also may want to sell, once everything has become “boring” and not “hypey” anymore. These are all signs to me that we are at a similar point as back in 2015. I’m going to revisit my reflections and diaries of 2015 so as not to make the same mistakes that thousands of people have made back then and to make sure, I keep my cool during volatile times. My Crystal Ball 3000™ predicts a year-end Bitcoin price of $ 8,000, which would fit my doubling theory of recent years. 2017 was just a runaway up, 2018 the correction back. So I do not think we’ll see an extremely bullish year in 2019, but rather a swing between $ 3,000 and $ 8,000 with a modest increase in bitcoin to around $ 8,000 by the end of the year. Since I had bought back into the market in 2018, I am therefore neither planning to sell but because of some uncertainties also not to buy more at the current moment. This is not financial advice, but purely my personal interpretation of the Crystal Ball 3000™. Furthermore, each of us is in a unique situation with different financial resources and income opportunities. You must therefore make your own picture of the different scenarios and thus come to your own conclusions for 2019. How do you see these scenarios? Did I forget a scenario? Where do you see Bitcoin at the end of the year? Please let me know in the comments! Would be very interested to hear. I will definitely reflect regularly and keep you updated on this. Do you have any questions? Something unclear? Feedback? Or do you just want to say “thank you”? I’m always looking forward to your comment. If you value this post, please share it and give me a thumbs up. Dr. Julian Hosp (www.julianhosp.com) is a world renown blockchain expert. He co-founded a Singapore based company in 2015 that has received over 100M USD in funding and grew it to close to 100 employees before stepping down as the president at the beginning of 2019. Crystal Ball 3000™ : Will the next crypto hype start in 2019? was originally published in Hacker Noon on Medium, where people are continuing the conversation by highlighting and responding to this story.